Much education data analysis (including ours) focuses on pupils – their characteristics, academic progress, destinations and so on. Relatively little attention is paid to teachers (an exception being our 2016 review of the School Workforce Census). This is in part because information about teachers and other school staff is much less readily available. Today we're announcing two new SchoolDash features that aim to close some of those gaps. A change in headteacher is always a significant milestone, and can sometimes prove transformative, so knowledge of where and when this has happened is important in fully understanding any school. We hope that this new feature helps in some small way to further this aim. 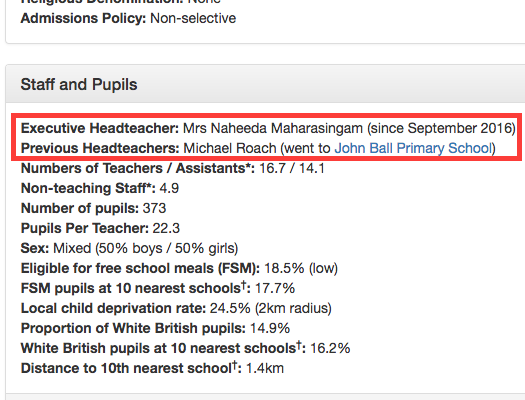 Of course, headteachers are far from the only significant staff to leave and join schools. But working out the movements of other teachers, technicians and the rest is an even tricker task, partly because there are so many of them and their roles are so diverse. One way of gaining an insight is to study schools' recruitment activity – which, fortunately, is often publicly visible through the recruitment ads posted on their websites. We've recently been looking at these for the roughly 5,000 mainstream secondary schools, sixth-form colleges and FE colleges in England. For now, this is no more than an experiment, but in the interests of openness we're sharing our preliminary findings in a new section of SchoolDash.com that we've launched today. Sources: Websites of mainstream secondary schools, sixth-form colleges and FE colleges in England. We plan to analyse this information much more fully in future, but for now we're going to focus on making the underlying data as comprehensive and accurate as we can. If you're interested, you can help too by looking at the postings we've found for teacher and technician roles in 18 different subjects and letting us know of any errors or omissions. As always, we welcome other comments or questions too – you can reach us at [email protected].